ENFiD envisions a community of Euro-Filipinos whose talents, contribution and potential as social and economic remitters are recognized glocally (global and local) and fully integrated in Europe, keeping their cultural values and traditions while enriching the diversity in Europe and being cognizant of the future generation. ENFiD is a fast-growing Europe-wide cross-sectoral, all-inclusive overseas-Filipino platform in Europe that has genuine developmental ambitions translated into timely and relevant actions for Euro-Filipinos and the Philippines. ENFiD is non-political, non-sectarian and not-for-profit network. It comprises members from different sectors of the society, including all political leanings. ENFiD’s foundations are formulated in its Constitution. It provides a forum for regional and global interaction between and among Filipino individuals and organizations within the European Community, with Philippines and with the rest of the world. It inspires and initiates non-partisan dialogues and discussions on relevant topics and participates in the international dialogue on ethical, cultural and political issues with a view to alleviate global poverty. ENFiD is an open organization that reflects the diversity of the Filipino society at large. As mentioned in its Constitution, ENFiD aims to bring different communities of the OF’s (Overseas Filipinos) and OFW’s (Overseas Filipino Workers) in Europe together, to function as a platform for exchange across European borders and to promote joint action for the cause of Filipinos in Europe, but also in support of the development of our home country, the Philippines. To be the prime organization of Euro-Filipinos in Europe in promoting programs, projects and activities that will lead to character transformation and strengthen solidarity, sharing and principled volunteerism in the framework of respect for human rights, upholding democracy and the rule of law, the Global Goals and the Paris Agreement. The Amsterdam-based Commission on Filipino Migrant Workers (CFMW) with satellite offices in Barcelona, Athens, London and Madrid, organized the first conference of Filipino Migrants in Europe held in Kerkrade, The Netherlands, attended by 180 Filipinos from all over Europe. 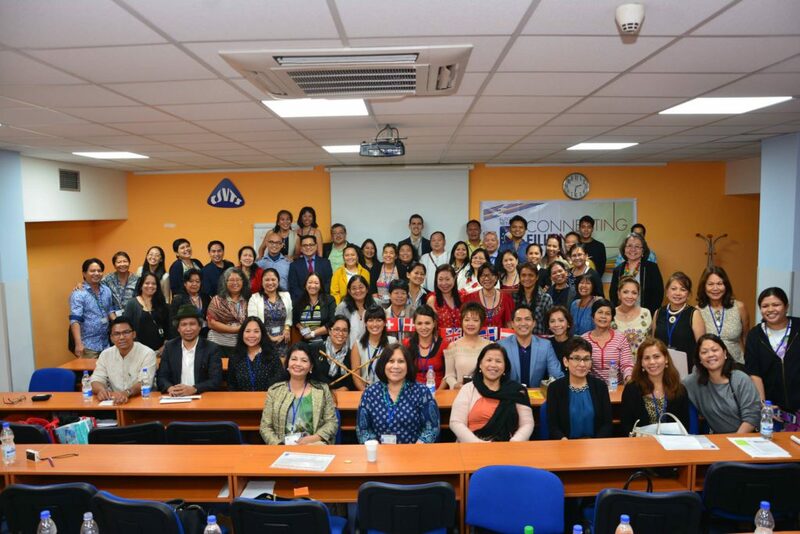 Several sector conferences ensued, among them the 1992 Women Conference that gave birth to Babaylan, the Filipino Women Network in Europe. The 2010 First Global Summit in Manila fostered talks to convene Filipinos across Europe led by Fil-Italy members of the Global Filipino Diaspora Council. 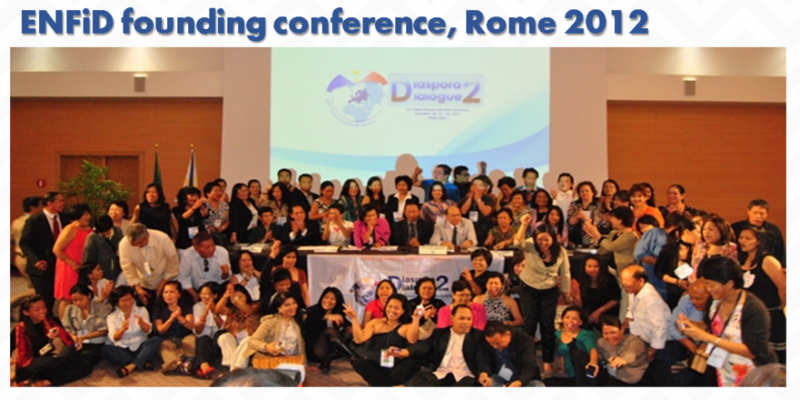 The talks ultimately materialised in September 27 to 29, 2012 when the European regional conference of overseas Filipinos was convened in Rome by the Fil-Italian community by an all-volunteer staff and hosted by the Philippine Embassy. For the first time Europe was host to Filipinos from the Middle East, Asia and North America. Using the flagship program of the Commission on Filipinos Overseas, Diaspora to Dialogue (D2D), as its main thrust, the “Rome Declaration” was formulated laying the foundation for fourteen attendees to officially establish ENFiD representing their respective countries in the new organization’s ad-hoc committee. Bayanihan para sa Biktima ni Pablo, a relief drive for the victims of Typhoon Pablo in the southern regions of the Philippines. ENFiD participated in IFAD Conference on Remittance Development 2013 and 2014 in Bangkok, Migration Trends Conference by IOM and Italian Foreign Ministry in 2014 held in Rome, Migration Conference in Stockholm, PinoyWise Conference in Kuwait, and the Middle East Diaspora Summit in Doha. ENFiD became a fully-registered, legally-recognised entity under the laws of the Republic of Malta on 31 January 2014. It held its first Annual General Assembly from 11-13 July in Madrid, Spain where new Board Members were elected at the assembly. By the new set of Board of Directors met in Paris to adopt a Five-Year Strategy Plan and agreed to set up a permanent secretariat. The number of countries where ENFiD was represented had swelled to seventeen. In late 2014 ENFiD collaborated with Commission on Filipinos Overseas in hosting the Ugnayan Project, a series of road trips across Europe to network with Filipino associations and groups in Europe held in Iceland, Denmark, Italy, Norway. ENFiD was represented at the Manila 3rd Global Summit of Filipinos in Diaspora. ENFiD has mobilised to organise its 2nd European Regional Overseas Filipino Conference, an event aimed to further promote the thriving of overseas Filipinos especially in Europe’s multicultural environment. This was made possible partly through newly-struck partnerships with the Commission on Filipinos Overseas and the PhilAm Life Foundation. ENFiD was also joined by it’s newest member ENFiD-Ireland .